A “ligament sparing knee” is when not all of the knee needs to be replaced or remodeled. The goal of the surgeon is to save ALL of the ligaments in your knee. Ligaments are like small pieces of rope that hold the bones together. The ligaments make your knee feel stable and secure during activity. The knee has 4 ligaments that provide this function, one on each side and two that cross in the middle. While I do my best to save all the ligaments, a knee replacement usually means that you will lose one or two of the crossing ligaments in the middle of your knee. This depends on how severe arthritis is in your knee. The knee is made of three parts or compartments. The compartments are the medial or inside of the knee, the lateral, or outside of the knee and the knee cap and the groove that it rides back and forth in. We have technology today that can allow the surgeon to replace two of the three compartments and is called a Bicompartmental Knee (a BiComp). 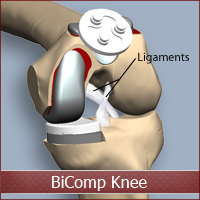 The BiComp knee has the potential to function and feel more like your own knee, especially during activity!